People often confuse cleaning for disinfecting. Cleaning is the action of removing visible, dirt, grease, water spills, grime and a few bacteria from a surface. Disinfectant, on the other hand, is a powerful solution that kills germs and bacteria upon contact. Daily kitchen activities leave food residue all over the kitchen from food preparation counters to sinks. 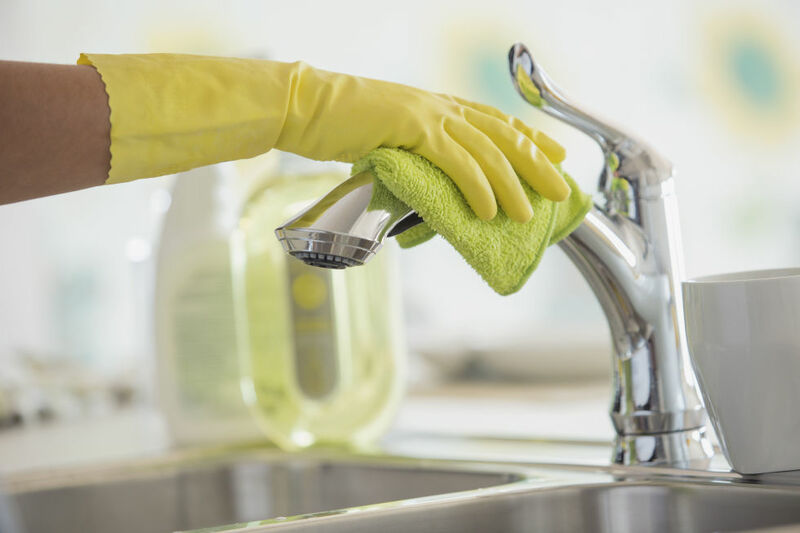 Germs and bacteria grow quite quickly, and by the time you are coming round to cleaning up a spill or washing dishes, you’ll need something stronger than a cleaning agent to kill the germs and bacteria that have already multiplied on the surfaces. Your kitchen houses more germs than any other part of the house. All the activity and food preparation that goes on in the kitchen leaves it susceptible to germs and bacteria that are harmful to you and your family. People often think that food only spreads harmful germs and bacteria if it is rotten, but food that is unrefrigerated can become a breeding site for bacteria even though it tastes great and does not look like it has gone off. These germs and bacteria can spread infection and create an unhealthy environment for you and your family to reside in. Food-borne illnesses are not only painful, but they are also terribly inconvenient as they take up days of potential productivity as a person recovers. While it is important to regularly clean your kitchen, this is not enough on its own to kill the germs and bacteria that cause food-borne illnesses. A disinfectant must be used as part of regular kitchen cleaning to kill germs and bacteria. The correct application of a disinfectant is important for killing the germs and bacteria in the kitchen. This effectively makes your kitchen a safe and clean environment for food preparation. Below are a few tips on how to use strong disinfectant on different kitchen surfaces. 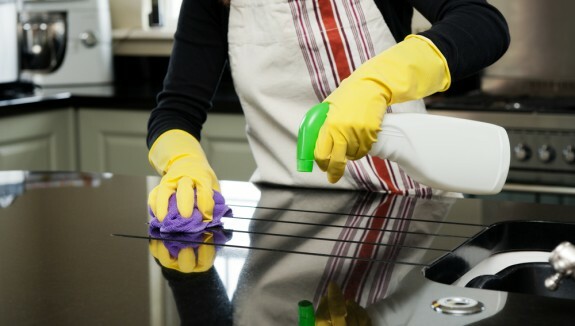 Clean kitchen counters every day by spraying disinfectant on a clean cloth and wiping down the counters. Refrigerators, cupboards and the pantry should also be wiped down with disinfectant. Many people forget chopping boards in the cleaning program. These need to be disinfected regularly, especially in kitchens where raw meat is handled. The best type of disinfectant for these surfaces is a chlorine or vinegar based disinfectant that will kill the bacteria growing from the pores of the chopping board. Scrub the boards down with this solution. The sink also needs to be disinfected after every use. It handles a lot of dirty dishes. After washing the sink with hot water, wipe it down with a disinfectant. Ensure the sink is left dry after cleaning, as damp surfaces encourage the growth of bacteria. Rubbish bins are worked hard in every kitchen. Over time, if not cleaned out properly and disinfected, the bin can end up smelling extremely bad which may also make the rest of the kitchen stink. While the bin should be emptied and rinsed as often as possible, it is also good practice to disinfect it every two weeks or so. After rinsing the bin, spray disinfectant all over it, including the lid and the pedal. Wipe it down with a soft cloth and if there is still a bad smell, spray a deodoriser. Often, we wipe tables after we’ve eaten. It is also important to do so before eating as germs and bacteria can develop on these surfaces over the course of the day. Sponges, cloths, dishrags and other cleaning aids are perhaps the dirtiest materials in kitchens. Don’t forget to thoroughly wash and disinfect them, especially after you’ve used them to disinfect everything else. Keep all disinfectant in their original containers and never mix disinfectants, even if they use the same chemical solution. Wear gloves while cleaning the kitchen. Do not touch your eyes or face after handling a disinfectant. Rinse your hands immediately with hot water and soap. Previous PostVacuum Cleaners Next PostGet your air conditioner repaired before it stops working! !